I’m proud to say that I’ve had the honor of seeing the future Hall of Famer, Brian Urlacher, play live a number of times; unfortuantely I was so high up in the stands I couldn’t really tell which one he was. At any rate, here’s to a great run Mr. Urlacher and may retirement treat you well! 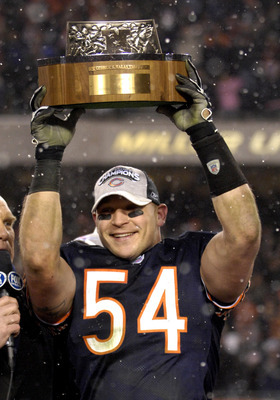 Brian Urlacher hoisting the 2006 NFC Championship Trophy. 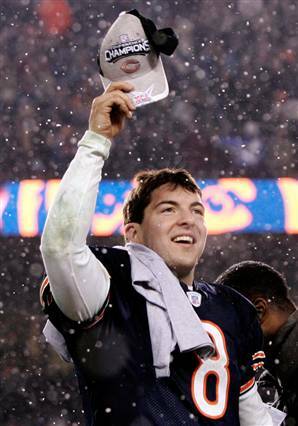 Rex Grossman hoisting his hat. It was later picked off and returned for a touchdown.